Doors open at 5:30 p.m., show starts at 7 p.m.
General Admission $46, reserved $90. Service fees not included. 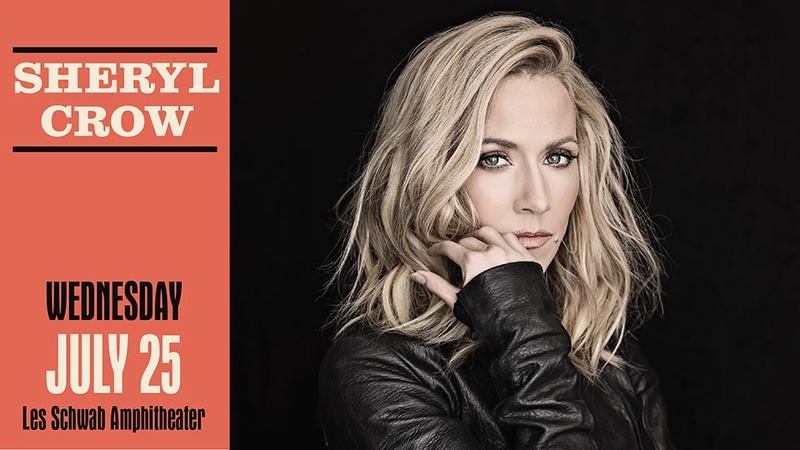 Touring on the tails of her 10th album Be Myself, a collaboration between herself and longtime producer Jeff Trott, Sheryl Crow journeys back to her roots with an introspective look at her early work. Her single “Alone In The Dark” is a throwback to early in her career, light and catchy and undeniably fun. The pop star has earned nine Grammys over the span of her career and sold more than 50 million albums. Her single “All I Want To Do” propelled her 1993 debut album Tuesday Night Music Club to Double Platinum status and launched her career. A little bit rock, a little bit pop and country, Crow put on one the Les Schwab Amphitheater’s most memorable shows in 2008 when she flew directly from the Democratic National Convention in Denver to Central Oregon for a crazy and emotional musical doubleheader.